1. The DNC can still rig its primaries. It’s really weird how amid all the excited chattering about Bernie’s 2020 primary run, there’s been almost no discussion of the known fact that the Democratic Party’s primaries were rigged against Sanders in the last election, nor about the fact that nothing has been done to stop them from being rigged again. DNC Chair Tom Perez boasted over the weekend that “new guidelines” have been put in place forbidding DNC officers and staff from endorsing or collaborating with particular primary candidates, but the DNC’s own charter already explicitly forbade that in the 2016 primaries and they did it anyway. Some powers have been peeled away from superdelegates, but nothing has been done to address the kind of blatant internal manipulations and Charter-violating bias we saw revealed in WikiLeaks documents. Perez has consistently dismissed the idea that this rigging took place, only ever acknowledging that there’s a “perception” that it was, and Nancy Pelosi has said that she saw nothing inappropriate at all in recorded proof of then-House Minority Whip Steny Hoyer’s brazen attempt to rig a congressional primary for an establishment candidate. It’s absolutely insane that this isn’t front and center in the conversation about Sanders’ candidacy, especially since it looks like Kamala Harris is the next Anointed Queen of the political/media class. If Sanders manages to win the primary it will be either because far too many people elevated him for the manipulators to successfully quash, or because the Democratic establishment is now satisfied that he doesn’t pose a threat to them. 2. Sanders would be better than Trump. Sanders is probably the most likely candidate to beat Trump, and he would be a marked improvement, not that that’s a high bar. The only arguments to the contrary come from partisan “boo, socialism” right-wingers and Trump supporters who still believe he’s spreading world peace and fighting the Deep State. I personally find those arguments neither convincing nor interesting. Even on foreign policy, someone who opposed the Iraq invasion has better instincts than pretty much everyone in Trump’s cabinet, some of whom actively facilitated that very invasion, and indeed better instincts than Trump himself. 3. He would also be far from perfect. I find myself unable to join in the jubilations over Bernie’s candidacy because of what I’ve learned and seen since the last election. Sanders not only refused to provide any pushback whatsoever against the DNC’s blatant subversion of the will of the people, but he actively fanned the flames of the establishment Russia hysteria which the Democratic Party used to completely kill the narrative about primary rigging. Contrary to the belief of some Bernie supporters I’ve spoken to, Sanders didn’t just pay lip service to some Russian interference once or twice and then change the subject back to healthcare and income inequality: he has gone full Rachel Maddow promoting the Russian collusion narrative many, many times. As we discussed recently, this baseless Russia hysteria that he has sold to American progressives will be used to attack him throughout the primary, and it will be partly his fault for promoting that narrative. While Bernie might not start any new hot wars or engage in the kind of obscene regime change interventionism we’re seeing from Trump in Venezuela, under a President Sanders we can expect to see a continued escalation of the world-threatening cold war against Russia, continued starvation sanctions against nations which fail to comply with the demands of the US empire, continued military expansionism around the world, and very little pushback against the depraved agendas of military and intelligence agencies. We can expect to see him play right along with the establishment narrative if the political/media class decides that Assad is gassing civilians and needs a dose of Tomahawk missiles, and we can probably expect him to facilitate the persecution of Julian Assange as well. 4. I won’t object to his candidacy. All that said, if Americans choose to uplift Sanders (and the DNC doesn’t thwart those attempts), I won’t raise my voice to object. As the citizenry of the nation with the most powerful military force in history, Americans are kept poor and propagandized to ensure the uninhibited movement of the power establishment which holds the gun. If Americans want to try and elect Sanders under some faint hope of maybe possibly getting to have healthcare or a $15 minimum wage someday, it’s not my place as an Australian to try and stop them. Contrary to what a lot of my critics claim, I don’t just make it my business to write about all US politics; I actually have a strict code where I stay inside my sovereign boundaries and only comment on the aspects of the US government which directly or indirectly impact the rest of the world. Given how brutalized Americans are by their political system, I see it as outside my sovereign boundaries to do anything which undermines their attempts to elect a progressive leader. Once he’s in office I’ll be just as critical of his bad foreign policies as I am of the current White House occupant, but I won’t be one of those aggressively critical alternative media figures working to kill his support. 5. Your fantasy Bernie-Tulsi ticket isn’t going to happen. A lot of my readers have been publicly fantasizing about the possibility of a Sanders-Gabbard ticket running against Trump, but there’s no way that happens. Gabbard has been far too disruptive to establishment war narratives, and thus has already been aggressively vetoed by the political/media class. US politicians can get away with disrupting establishment narratives a bit when it comes to domestic policy, but if you try it with foreign policy you’re immediately blacklisted. Sanders never makes moves that are that severely transgressive of establishment doctrine. If he becomes the nominee, he’ll pick someone safe like Elizabeth Warren or Keith Ellison. 6. Sanders is more interesting as a phenomenon than as a candidate. Sanders will be one of the few candidates in the race who will be consistently promoting clear, specific progressive policies instead of wearing a plastic smile and reciting scripted talking points designed to offend the smallest number of people possible, but we’ve seen him do that already, probably in exactly the same way he’s going to do it this time around. 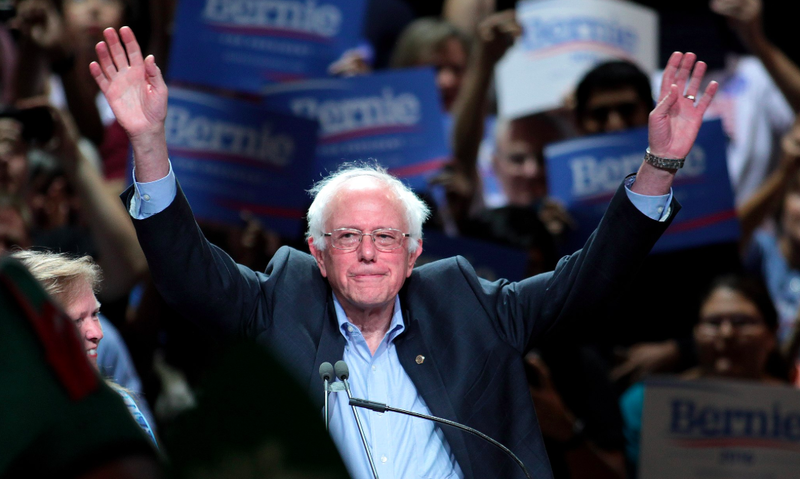 What makes Sanders interesting is not Sanders himself, but the Sanders movement. I personally do not believe that the establishment is afraid of Sanders. Sanders is just one man, and even if he really is hell bent on destroying the oligarchy and bringing power to the people, they can deal with just one man. What they truly fear is millions of people rising up in a populist movement to take power for themselves, and using every tool in their toolbox to make that happen. If millions of Americans can resist the attempts to manipulate and herd them in directions which pose no threat to the plutocracy and insist on economic and institutional justice to the same extent that the Yellow Vests in France are, for example, that would absolutely terrify our rulers. And that’s what we can expect to be the area of narrative control emphasis with regard to Sanders’ campaign: not keeping Sanders from being elected, but keeping the public from developing a revolutionary spirit. An enthusiastic Sanders campaign will get the mass media manipulators working very hard to control the narrative and keep everyone herded into their lanes, and they often expose themselves for the malignant liars they are when they do that. Anything that causes the propagandists to lose control of the narrative is a good thing, and the Sanders campaign may do just that.